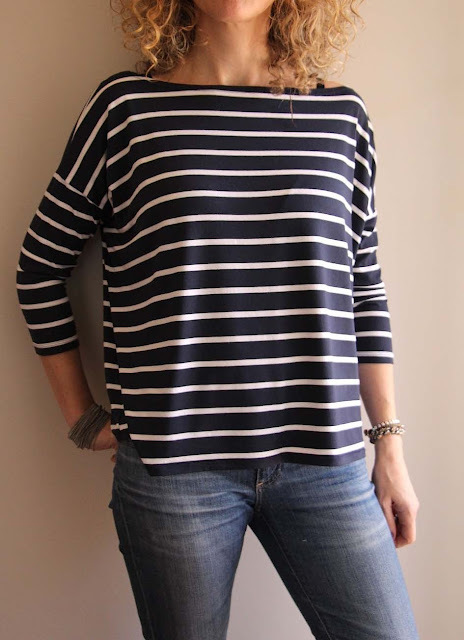 I made one Mandy Boat Tee and then headed straight back to the sewing machine to make another. It's a super quick sew and the kind of garment that has a place in every wardrobe. My first version is made up in this viscose/spandex jersey. Regular readers will know that my love of stripes knows no bounds. And navy and white stripes? I'll take it just about every time. After I made this first one and immediately loved it, I knew I needed a plain black version. In the stash, I found a drapey poly/spandex (Philosophy Black- $18/m - available all stores) which I used for the front and black. For the sleeves, I used a thick black ponti. Because I wanted the fit to be super slim on the arms, I overlocked a further 1.5cm from the underarm and side seam. Regarding length, I simply shortened it at the hem to my preferred length. If you're preference is for less fullness and a narrower neckline (as mine was, second time around), just take it in at the centre fold line on both front and back. And if you do this, don't forget to adjust your sleeve length accordingly. The thing I love most about this pattern? The neckline. It just sits beautifully across the collarbone and there's a neat and simple stitch on either side that gives the perfect finish to your boat neck at the shoulders. Have you met and made Mandy yet? If you haven't, I'm pretty sure you'll like her. And who knows? She might even become your best, close(s)t mate.